[tweetmeme]After a short break, I’m back with the third in the social media strategy series. Next up: Identifying Goals and Objectives. If you missed the first two head here. Once you’re sure that social media is right for your business and gained necessary buy-in, the next step is to identify your goals and objectives. I’ve seen these two confused, so for the sake of clarification here’s my definition: Goals are general, wider intentions whereas objectives are precise, measurable steps that help you to achieve your goals. 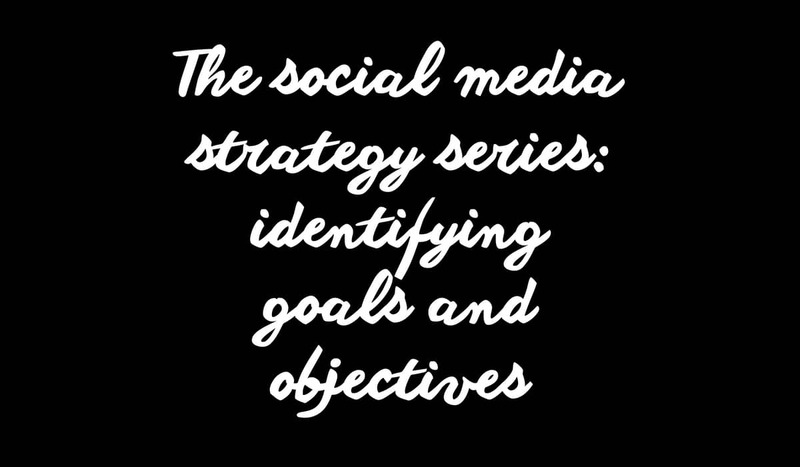 Identifying your objectives for social media is essential. If you have no specific reasons for using it, you’ll spend a lot of time having very enjoyable conversations, but these will achieve nothing. You’ll have no results to show how it’s working for you, no justification for the time and budget spent on it. Before long the powers that be will, naturally, question the investment and the activity. And nobody wants that. So start with your business plan and marketing strategy. What overall business goals do you need to meet? Break these down and think about whether social media can help you meet them. Be realistic, social media isn’t the answer to everything. Much better to identify those goals you can realistically achieve. If you have a marketing strategy (and if not, why not?) go through those goals and pull out those that social media can help you to achieve. The key here is to align your social media objectives with your business goals to ensure you can achieve what you need to. There is a wide range of objectives social media can help you with and I’ve listed an example of these below. Obviously this list may not be right for your business and you won’t know which objectives are right until you’ve analysed the business plan and/or marketing strategy, but it gives you a good idea of the types of goals you can achieve by using social media. Now I wouldn’t suggest including all the objectives above. You’ll be setting yourself up for a fall if you do as there are far too many to manage. Instead pick out the key objectives you can achieve and don’t forget to apply the SMART rule: all objectives should be Specific, Measurable, Attainable, Realistic and Timely. You’ll need to apply realistic timeframes to each one and identify the metrics that will allow you to measure whether you’re achieving what you set out to. Both of these I’ll be covering in future posts in this series. ** Update: This social media strategy series has since been pulled together and published. Download the social media strategy ebook here. Gemma, this has been an excellent series. As a PRO,I agree 100% with your cautioning clients to stop a moment and think through why they want to engage in social media. Many clients think that just because everyone else is on it, they must be too, but they risk the danger of blundering onto the scene, without a clear idea of why you are there or what they wish to achieve,if they do not ask themselves the questions you have outlined here. Thanks for that, and yes I see this happen all too often. I guess it’s our job to educate and enable them to do it properly.